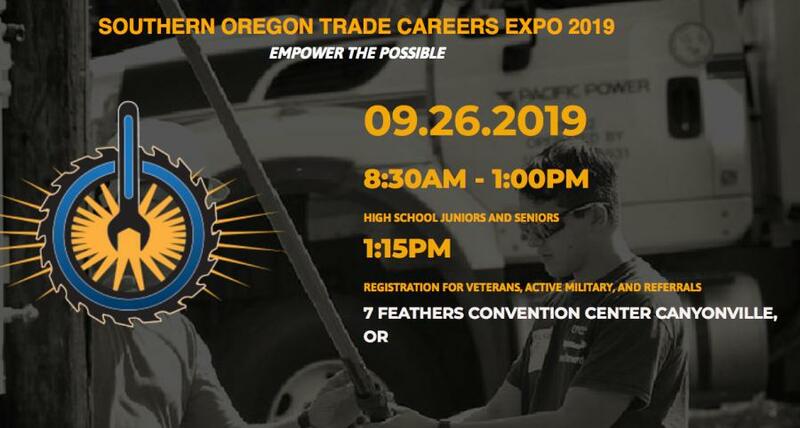 More Than 1,200 high school students, veterans and active military from throughout southern Oregon are expected for a full-day, hands-on experience at the second Southern Oregon Trade Careers Expo, Sept. 26, 2019, in Canyonville. "This is an excellent opportunity to expose those targeted groups to the living wage opportunities available in the southern Oregon construction and utility trades," said Christie Meacham, ODOT regional workforce and civil rights specialist. ODOT is one of several sponsors of the "Empower the Possible" event. The morning session will include high school students from throughout southern Oregon. The afternoon session is designed for veterans and active duty military personnel and referred public/private agencies. "To have everything at that one venue [in 2017] was a great opportunity. And by far was one of the best trade fairs I've been to since I've been teaching," said Kirstie Christopherson, North Medford high school career and technical education teacher. In 2017, more than 770 students, 66 exhibitors and nearly 100 job-seeking veterans and disadvantaged youth attended from Jackson, Josephine and Douglas counties. This year participants will include students from Coos, Curry and Klamath counties. "The success from 2017 certainly got my attention," said Curry County Commissioner Chris Paasch. "Veteran agencies, including the Oregon Department of Veteran Affairs, look forward to matching veterans and career military with career opportunities found at the SOTCE." For more information, visit empowerthepossible.org/.